NB: There is a choice of Car-Hire firms at Limoges Airport. Each one operates from a small building immediately outside the airport terminal. There is no bus service from the airport to the city, but taxis operate from the terminal building. The low-cost airline RyanAir operates daily direct flights to Limoges Airport, about a 40-minute drive from La Croix du Reh. Flights can cost from as little as £35 return and are very much the cheaper if you book via the Internet and as far in advance as possible. Leave it until the last minute and the cost can sky-rocket. Flights to Limoges, currently using new and spacious Boeing 737-800s, flight time and number of daily flights are changing depending on the season. Worth knowing: One of the most important things to know about Ryanair – and it’s only in their small print – is that the checked-baggage free allowance is only 15 kilos – not the 20 kilos common with most airlines in economy class and which used to be operated by Buzz, which Ryanair has replaced. If the aircraft is heavily booked you may well be charged for any excess (6 euros per kilo). The policy is quite strictly enforced when checking in at Limoges, so if your bags are heavy be prepared to pay up. There is often a long queue of passengers caught unawares. But you might get away with it if you are only a kilo or two above the allowance – there appears to be some discretion, but certainly not much. UK airports are usually is very busy and long queues are common at the departures and security check. So allow plenty of time “airside” (after passport control area) for your shopping and to get to the gate for your flight. Ryanair operates a free-seating policy, but those who check in earliest are offered preferential boarding at the gate. Boarding cards issued at check-in carry a code number which determines your priority. It appears that you are likely to be among the first to be served if you are seated near the front or rear of the plane. Most passengers seem to head for the door nearest the front, simply because it’s the nearest to the terminal building. But if you take the trouble to walk to the rear door you will find less of a logjam and a wider choice of seats. And don’t forget, like just about every other airline these days, all Ryanair flights are non-smoking. 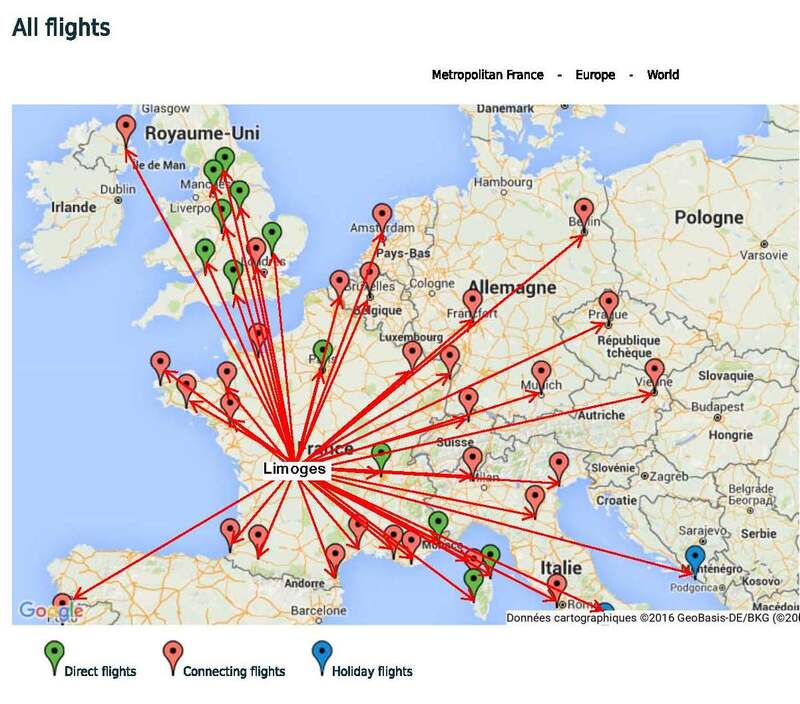 Flybe airline operates 2 direct and several connecting flights to Limoges. The direct flight is from Sothampton and Birmingham. The flight times could change depending on a season. The fares vary depending on a deal. Connecting flights seem to take a long time from A to B, but at least you do not have transfer from one airport to the other and have 2 or 3 hrs break in Southampton. Flybe has customer friendly, easy to eye website. Air France operates daily services to Limoges from Paris Charles de Gaulle and Paris Orly, both of which take approximately one hour. Connecting Air France flights from the UK arrive at Charles de Gaulle Terminal 2F and depart for Limoges from 2D. British Airways flights from the UK arrive at Paris Charles de Gaulle Terminal 1. Transfer buses will take you from Terminal 1 or Terminal 2F to Terminal 2D for the flight to Limoges. If you are travelling via Paris your baggage will be checked through for you – but make sure you allow enough time for the transfer. If your transfer time is about an hour or less then your bags might not make it – ours didn’t four times in the space of 12 months. And because there is only one flight per day from Paris Charles de Gaulle, your delayed baggage will take at least 24 hours to catch up with you. This happened to a guest of ours who was going to a wedding – panic stations, as you can most probably understand. The Air France flights from Paris to Limoges are served by a small but comfortable jet and all seats are allocated when you check in, which you can do in advance at the UK airport. And there is more legroom in Row 8, so it’s worth asking if a seat in that row is available. When returning to the UK, you will need to check in promptly at Limoges for your flight. Immigration officials appear to be in short supply, so the gate will be closed by the time the UK flight arrives to enable the officials to deal with the disembarking passengers. If it is closed and you have not yet passed through the security check you may be denied boarding, even though the other passengers have yet to board and are only a meter or two away from you. Don’t forget to make your checking on-line and print the boarding pass before your leave for the airport, as it could cost you upto 65Euros for check-in and issuing the boarding pass at the airport. The café at Limoges airport is tiny, with only a few tables, you could go outside if weather permits. Once you have passed immigration, there are currently 2 vending machines at the departure gates, nowhere near enough seats if the flight is full (which it often is) but there is a lavatory, so it’s best to be forewarned. The parking at Limoges airport must be paid. Our general experience of Ryanair and Flybe, and we have personally used the service is extremely good. Biggest “plus” are the low fares. Biggest “minus” is the 15 kilos allowance. Air France is good too. Biggest “plus” is the connections network to other UK and world-wide airports. Biggest “minus” is the distinct chance of your bags not making the Paris transfer if not enough time is allowed.